Earlier this year, we entered eVolo’s annual skyscraper competition and the objective was to challenge the way people understand vertical architecture and its relationship with the natural and built environments. It is a concept competition hosted by the avant-garde architectural magazine eVolo, which values novel, original and visionary ideas. Our proposal, to put it in one sentence, was a continuous horizontal skyscraper around the full perimeter of a sunken Central Park (a “Sidescaper”, as called by some articles later on). This idea we came up with drastically challenged people’s understanding of a skyscraper, meanwhile addressed several social and environmental contradictions that big city like New York faces today. The bold concept was eventually chosen as the 1st Place winner among nearly 500 entries received around the world. We are very glad we participated, not because that we won, but the fact that as young designers, we could have the chance to put some ideas on paper and be noticed, discussed and even criticized by a wider audience. Looking back, we also realized that to complete successful entries requires more than just hard work. Why am I participating? What do I want to get out of this? 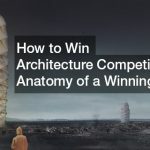 Architectural competitions can be both time and energy consuming, and most of them requires you to pay a registration fee. So always ask yourself these questions before taking on the challenge. 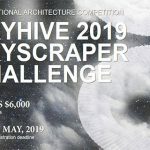 There are many things one can get out of participating architectural competitions other than the prize: Build up a strong personal portfolio, enhance design thinking and skill, a little escape from everyday school or corporate project, etc. The list can go on and on and none of them requires winning places. 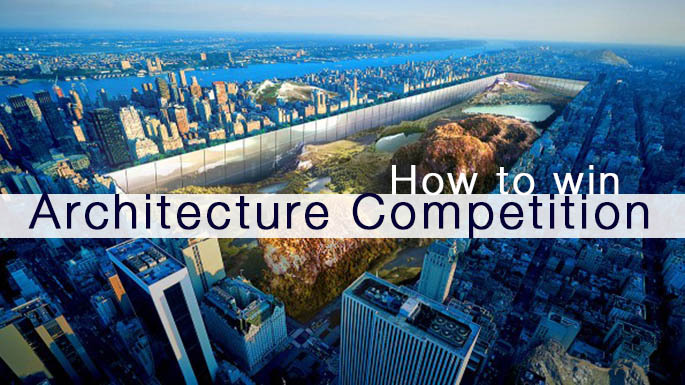 While it would never hurt by aiming high, design competitions aren’t standardized tests. There is a good chance that you may not win, and there is no right or wrong between winning projects and all the other entries. 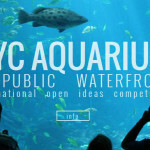 In other words, participating in design competitions shouldn’t be all about winning, rather, it is a safe way to express one’s original ideas with less responsibility and risks than doing practice in the real world, and a great opportunity for you try the best to produce your top quality work without any fear or constrains. Working on competitions should be a rewarding and enjoyable experience. Remember, this is your own work, you are the one who gets to make all the decisions, and no one is forcing you to do this. So don’t waste time thinking what the juries wants, what the audience might say. Good attitude will help immensely along the way no matter what the outcome is. 2. Choose the Right Competition and the Right Team. Competitions are good opportunities for people who looking for chances to supplement their professional or school experience with some independent ventures. So know the strength of yourself or your team and choose the competition that interests you and suit you the best both time-wise and strategy-wise. Since there are mainly two kinds of competition – conceptual and real commissions, make sure that you choose the right path to maximize you and your team’s advantage. Unless you want to try out different things to test your potential and learn more. As pointed out earlier, once you know what you would like to get out of this competition, it is not very difficult to choose the right path. 3. Read the Entry Criteria and Requirements Carefully. The least thing you wish to happen to your idea is any mistake caused by misunderstanding or neglecting the design brief, so you should read it carefully. The better you comprehend the requirement, the more convincing your work would probably be to the juries. If the organization has hosted competitions in the past, try check out some previous winners’ work, as it might help you know their focus and criteria more clearly, in order to avoid any obvious mistakes. 4. The Balance Between Concept and Practicality. While the design brief addresses all the technical requirements, it may not say too much about this. As we participated in an idea competition, this question was one of our earliest discussions, probably also the most important one. Take our own project as an example. In reality, digging down and creates an underground park means there would be a lot of practical concerns, things like underground water, pipings, subway systems, bedrocks etc. If we choose to address every single one of these issues, and use half of the board explaining how some of them can be solved while others not, the big idea would almost certainly be weakened. In our case, we chose to not emphasize some of these practical concerns. This may cause some doubts from the audience, but at least most people get a clearer message of our strong ideas. This is not saying bold concept is more important than reality, but don’t miss the forest for the trees. Also it is true to our specific project, but might not apply to your project. Just remember, no matter what competition you are interest in, it will certainly ask for something new. That means probably it is not about creating for the sake of being new, but it is backed by a good reason. 5. Good Presentation Means Working Backwards. Often, for architectural competitions, the only opportunity for you to convey your idea to the viewer is through the submission boards. Everything else, your thinking process, research, sketches, study models, although equally important, are hardly presented to the juries. So you must make sure your board have a great presentation, so that it can leave a great first impression to the viewers. To achieve that, try have the a rough vision (how do you want the board to be like) already in your head, before all the other works even starts. If possible, do layout sketches, set up the blank page file, put in placeholder images and text frames, and fill the gaps afterwards. Working backwards has two big benefits: On one hand, it helps you with the thinking process, you are always actively thinking while drafting the boards, being clear with what you want without getting too lost in the exploration. On the other hand, it is a great progress indicator, which helps you avoid wasting time on unnecessary work as the deadline approaches. After all, design competition is mostly about sharing ideas with people. It is always beneficial when you try to summarize and present the project to others, both inside and outside the field of architecture, and ask for their opinions. Because the concept is always clearer to you than it may appears to others, this practice helps you to sharpen the idea and convey the vital charisma of the project within a few sentences. Moreover, the feedback from others may point out something you overlooked or ignored before, these easy fixes, added up together might make a big difference to your final product. Young designers are often trained to be focus on the work by devoting so many hours in perfecting any details. While there is nothing wrong about it, we should also start to learn how to better handle the business side of our careers. This could start by simply submitting works to publishers selectively, writing articles for magazines, build a good website, seeking exhibition opportunities, and etc. In today’s world, there is more ways to promote yourself than just doing good work quietly and waiting for others to discover you. It is not easy to establish a name at one’s early career path, so start putting your best competition work in the portfolio, post it on your website no matter what, and if you do win something, hold the chance to promote yourself via different media channels. I hope this look at the most practical advices have inspired you in some way. We’d love to know if you agree that these are the most important things for architects to consider? If you have other thoughts on what’s important. Please add to the discussion by commenting below. Jianshi Wu and Yitan Sun are a New York based designers. Their collaboration has received numerous awards and has been published internationally in numerous publications including The Guardian, Forbes, CNN, Archdaily and Architectural Digest. Their recent concept project “New York Horizon” was selected as the 1st Place winner for the 2016 eVolo International Skyscraper Competition.